There are going to be and have been a lot of wonderful games available at retail during 2012. Covering just about every genre under the sun, the gaming industry is a wonderful place this year when it comes to titles. I'm here, unfortunately, to tell you that Medal of Honor: Warfighter is purely mediocre. Its average presence is further brought down by bugs, texture oddities and sloppy AI. It's best you avoid this one. Try hard not to stand out. Medal of Honor: Warfighter, in almost every aspect, feels like the result of focus testing. EA clearly wanted a yearly shooter, and DICE must have refused the notion of creating a brand new Battlefield every 365 days. So, the massive games publisher turned to Danger Close to create a Medal of Honor title in Battlefield's off years. 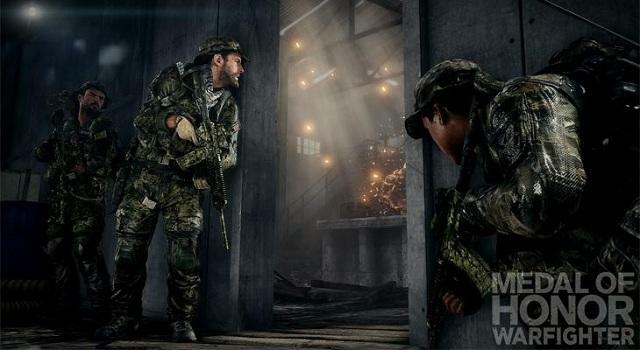 That's what Warfighter is: a stop-gap between Battlefield 3 and Battlefield 4. Actually, the fact that Battlefield 4's upcoming multiplayer demo is advertised on the front and center of Medal of Honor: Warfighter's boxart should be enough to tip you off to this point. EA's not all that serious about this game. Too bad the same can probably be said for everything else related to the project. The focus testing is so evident that almost nothing about Warfighter feels special. It's like EA roped up average teenage shooter fans, put them in a room and asked them what they remember about the latest military blockbusters they played. Then, they took that information and built a plot line around terror and special soldiers. Here's how I imagine these meetings went down. So you liked breaching doors in Battlefield 3? Cool, we'll add that. Oh, you liked the mixed storylines between soldiers who eventually cross paths that Call of Duty offers? Nice, we'll make sure that's in the game. Listen, we don't want to surprise you at all with this game, so we'll go ahead and keep it as familiar as we possibly can. This game plays everything too safe. 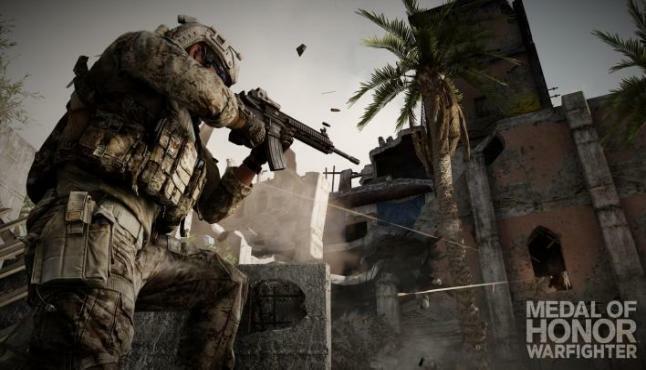 Medal of Honor: Warfighter, in almost every aspect, feels like the result of focus testing. By the time Warfighter hits its paces, you'll be so entirely familiar with what it has to throw at you that there will be no room for fun. You'll follow companions and shoot when they tell you to, you'll drive cars that are seemingly invincible, you'll jump out of an airplane but have no control over the fall and you'll be force fed a tepid storyline. Medal of Honor: Warfighter provides nothing concise to connect with. The cutscenes (which froze and crashed often during my playthrough) are incredibly generic, while occasionally nice to look at. They'll prop up a warfighter and his family, but gamers will have an awkward time trying to understand their motivations. The same applies to the general course of the game. "Terrorists are bad" is just about all the background you'll be given when it comes time to hunt down and kill your enemies. The game slaps names on your friends and is kind enough to repeat them constantly, but that repetition does little when "major plot points" come into focus and folks start dying. When the hammer supposedly drops during this campaign's climax, it does so with such a small and faint tap that the experience feels practically devoid of emotion. It doesn't help, of course, that the corridor shooting and seriously whacky difficulty ramping makes the closing hours of the campaign laughably frustrating. A crash course in normalcy. The AI in this game is both stupid and bland. They absorb bullets, remain stationary and seem only to fire at your and not your friendlies. Your friendlies are completely useless, often shooting what must be nothing but blanks. The multiplayer component offers up some frills, but it does so in a season when other games are offering much, much more. As a shooter, Medal of Honor: Warfighter is simply competent. It never strives to reach unfamiliar territory, instead feeling like a collection of moments from other games. There's some minor value to be had in the multiplayer portion of this title, but the rest of the experience is completely and entirely average. You'll have so many better places to spend your money before 2012 draws to a close. We purchased a copy of Medal of Honor: Warfighter for the Xbox 360 with company funds. We installed the optional texture pack before playing the game. Before writing this review, we completed the full campaign on normal difficulty and played the multiplayer portion for roughly four hours.